This morning, one of my Facebook friends, Norma, mentioned that she was going to the beach. She had a friend up in Springfield, Mass that said he wanted to go too. I probably won't go to the beach. If I go out into the sun, I tan so fast that I'd end up looking like a surfer dude. I don't mind that, but when you're interviewing for Project Management positions, looking like you spend your day sitting on the beach isn't exactly the best thing for portraying your professionality. On the other hand, we have a great beach. I used to drive 1206 (yes exactly) miles from my place in Pennsylvania to this particular beach to do what these folks are doing now. I'd lay out and bake and turn nut brown and come back and make everyone jealous. I wouldn't lay out flat on the ground here facing the street again though, the beach is angled fairly sharply to the water's edge. One time I hit the perfect storm of time of day, sun angle and my laying feet toward the street and managed to sunburn my sinuses. I never want to go through that again! Although this picture was taken in June, I would bet that the beach today will be just about as crowded. There are no tarballs yet washing up here, no Kiss of BP's Incompetence destroying the beach yet, and plenty of sand to lay out on. This may not be forever since the Gulf Stream is only 8 miles off shore here. If you're planning on coming, now's a good time to do it. 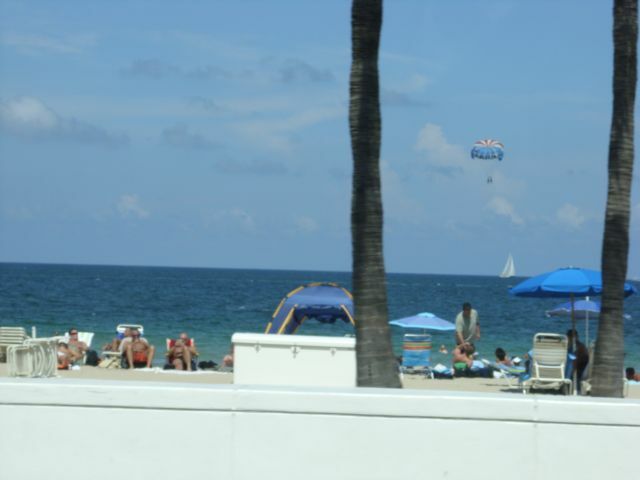 You can even go up and parasail like one person did in this picture. I've wanted to do that but have always wondered how I'd taste to a shark. It looks like a wonderful adventure, I'd have to take a camera up in a plastic bag if I went, but I think most likely it will just be a wonder rather than a memory - I'll probably never do it.